Note: This is the second installment of a doubleshot review. If you missed it, look at last Friday's take on the same book from ?wazithinkin. 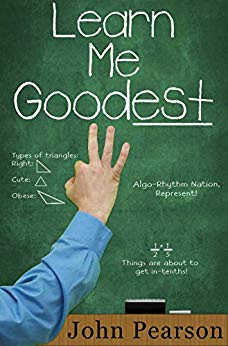 “First there was Learn Me Good, the (sort of, kind of, mostly) true story about a first year teacher learning the ropes. Next came Learn Me Gooder, the story of an experienced teacher who should know better making first-year teacher mistakes. Now, as the third book in the series, Learn Me Goodest enshrines the series alongside beloved and revered trilogies like Star Wars, The Godfather, and Beverly Hills Chihuahua. After being laid off from his job as an engineer, John Pearson made a drastic career change and became an elementary school teacher. His initial year of teaching provided material for his first book, Learn Me Good. Its popularity among Kindle owners convinced Pearson that just one book with a grammatically incorrect title wasn’t enough. Hence, he released the sequel Learn Me Gooder and now expands the series into a trilogy with Learn Me Goodest. Pearson lives in Texas and is proud of attending both Duke and Texas A&M universities. (Insert your favorite Aggie joke here.) For more, visitPearson’s blog. Like John Pearson, the author of this book, his fictional alter-ego Jack Woodson has had a career change. Each were once engineers, but then became elementary school teachers. This book follows the same format as the prior books in the series, formatted as a series of emails from Woodson to his former co-worker Fred Boomerson who apparently then discusses the contents of Woodson’s reports to the rest of the crew at Woodson’s old employer and let’s Woodson know their reaction. Although the third in the series and there might be a small benefit in having read the prior books, this book can also be read as a standalone.